These white pop beads with four extra holes, equally spaced in a 90° plane from the axis of attachment, are typically used to form the nucleotide backbone. Size: 10 mm dia. Package of 300. Size: 10 mm dia. Packages of 300. Simulate hydrogen bonds. Package of 100. Build your own genetic models with these 5-hole pop beads. Holes are equally spaced in a 90° plane from the axis of attachment. 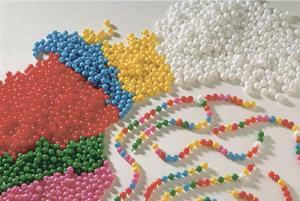 Beads are typically used to form the nucleotide backbone.